Photo by Michael Reagan Photography | Pictured from left to right: PJAL Executive Director Roland J. Dartez, Public Service Commissioner Foster Campbell, Jr., State Treasurer John Kennedy, U.S. Representative John Fleming, PJAL President from St. Martin Parish Guy Cormier, Caroline Fayard, U.S. Representative Charles Boustany, and Rob Maness. Shreveport, LA— The Police Jury Association hosted the first statewide US Senate Forum during its 92nd Annual State Convention in Shreveport on March 5th. The six candidates joined nearly 1,000 elected to share their vision and candidate platform. The PJAL represents all 64 parishes advocating for local government and parish issues at the state capitol and Washington DC. 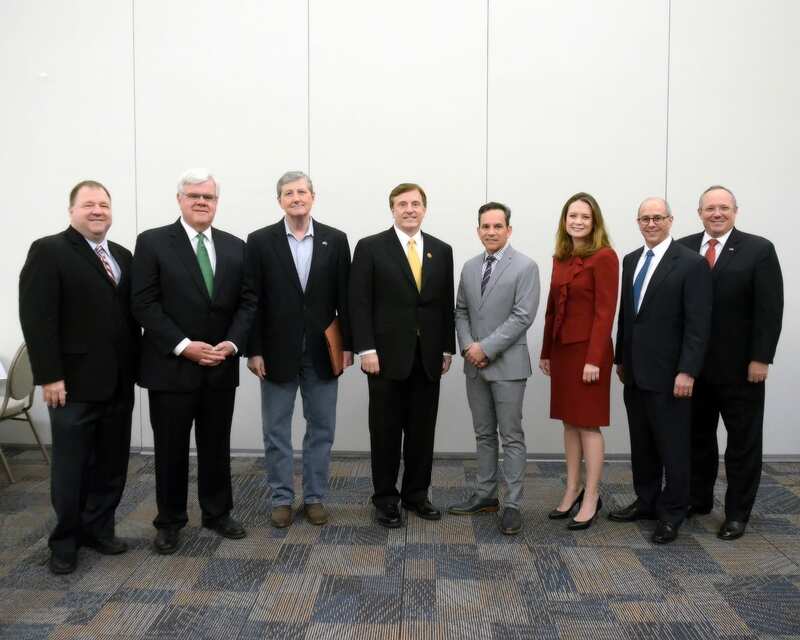 The Senatorial forum was attended by current U.S. Representative Charles Boustany, current Public Service Commissioner Foster Campbell, Jr., Caroline Fayard, current U.S. Representative John Fleming, current State Treasurer John Kennedy, and Rob Maness. Each focused on the current status of Louisiana, the effect of the elected position at hand and their plans should they be elected. 2016 PJAL President Guy Cormier of St. Martin Parish presided over the forum. The Police Jury Association was honored and grateful the candidates were able to address its membership, and look forward to working with them in the partnership between local and state government to serve the citizens of Louisiana. Also during the convention that took place at the Shreveport Convention Center March 3-5, attendees were given Congressional, state and local updates on a variety of issues. They also visited with over 80 interest groups related to the day-to-day operations of parish government. Elected and appointed officials such as Lieutenant Governor Billy Nungesser, Governor Deputy Chief of Staff Toye Taylor, DEQ Secretary Dr. Chuck Brown, GOHSEP Director Jim Waskom, Wildlife & Fisheries Secretary Charles Melancon, DOTD Secretary Shawn Wilson, National Association of Counties 2nd Vice President Roy Brooks and USDA Rural Development State Director Clarence Hawkins addressed the local government leaders during committee meetings. Public Service Commissioner Scott Angelle was the keynote speaker at the Organization of Parish Administrative Officials Luncheon. US Congressman Garrett Graves was the luncheon keynote speaker. The convention was a special time for outgoing President David Cox of Caddo Parish. During the Saturday night banquet, he spoke to members in the crowd thanking them for their continued service and praised the Police Jury Association for tirelessly working to improve and assist all 64 parish government entities. 2016 President Guy Cormier acknowledged all the past presidents that were present expressing his desire to lead like they did to continue the improvement of the state by working as a team. “Our members, elected and appointed, are vital to a parishes’ day-to-day operations. I look forward to leading an association dedicated to bettering the lives of each of our citizens,” said 2016 President Guy Cormier, St. Martin Parish. Topics of conversation ranged from special session and future legislative sessions, tax reform, member services, state and federal budgets, local government financing, ethics, highway funding, tourism, emergency preparedness, drainage and much more.